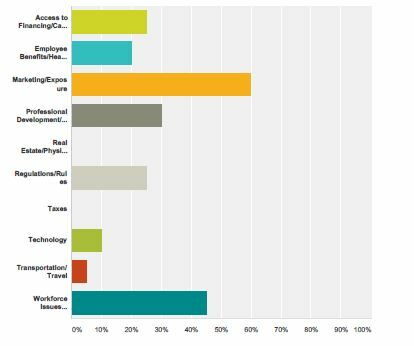 Many of our participants have utilized interns before, in fact 30 percent of respondents who utilized interns hosted 1-3 internships over the past two years. However, barriers such as locating good candidates, funding and creating work activities and unfamiliarity with regulations were a factor for many of these members. Additionally, nearly 75 percent of those who utilized interns were motivated by developing talent that might go on to work in their organization. Learn more about hiring an intern here. Of our respondents, 50 percent say the need for marketing and exposure is currently limiting their business success. For 40 percent of the participants, workforce issues such as employee recruitment, advancement and training is limiting their success. Employee benefits, regulations, access to capital and professional development were also listed as factors. Every business or organization faces limiting factors. Whether or not they can overcome them determines the best business success. It is The Chamber’s mission to maximize our members’ success, the community’s competitiveness, and the area’s economic strength. Visit the members only section for tools and resources to increase your visibility. Ana Molinari Salon Spa Boutique – Celebrating 35 years of business in Sarasota. Budget Self Storage – Celebrating 30 years and broke ground on a new and fourth location in Sarasota. Child Protection Center – 2015 marks Child Protection Centers’ 35th year. In the last few years, CPC has increased awareness about child abuse and CPC’s programs and focus in the prevention, intervention, and treatment of child abuse reaching 48,000 individuals. CPC has increased public funding by 54%, which, as a result, has allowed for increased staffing to fill program gaps. Complete Small Business Solutions – Complete Small Business Solutions (Brian McGinn, CPA) was named Accounting Practice of the Year by the Professional Association of Small Business Accountants. La Musica, Inc. – La Musica will be celebrating 30 years this coming season in April 2016. Siesta Key Chamber of Commerce – Was named TripAdvisor’s #1 Travelers’ Choice™ Top 25 Beaches in the United States & 12th in World. Also named # 1 Beach – Best Beaches in the World 2015 USA Today Reader’s Choice Top Beaches in Florida. USF Sarasota-Manatee – The University of South Florida Sarasota-Manatee is celebrating its 40th Anniversary of service to the community. In June, USF’s Board of Trustees removed the freshmen/sophomore enrollment cap and approved USFSM’s long-term strategic plan. In May, USFSM’s College of Education earned an additional, prestigious national accreditation. All members are all encouraged to participate in Chamber Member Intel surveys. Links to the online surveys are sent via email to the membership. The current survey focuses on employee recruitment and best practices. This survey closes at the close of the business day on Monday, August 24. One lucky respondent will win Tampa Bay Rays tickets! For more information about these resources and the full results from Chamber Member Intel thus far, visit our website.